Fiddler's QuickExec box allows you to launch script-commands quickly. Hit ALT+Q to quickly set focus to the QuickExec box. If Fiddler isn't active, hit CTRL+ALT+F first to activate Fiddler. 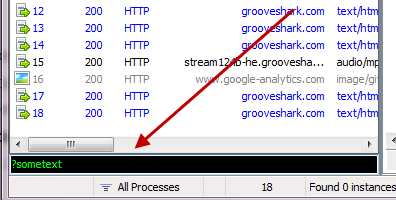 In the QuickExec box, hit CTRL+I to insert the URL of the currently selected session in the session list. As you type sometext, Fiddler will highlight sessions where the URL contains sometext. Hit Enter to set focus to the selected matches. Select sessions where response size is greater than size bytes. Select sessions where response size is less than size bytes. Select sessions where response status = status or request method = method. Select sessions where the request host contains host. Hit Enter to set focus to the selected matches. Create a request breakpoint for the specified HTTP method. Setting this command will clear any previous value for the command; calling it with no parameter will disable the breakpoint. Create a request breakpoint for URIs containing the specified string. Setting this command will clear any previous value for the command; calling it with no parameter will disable the breakpoint. Replace any string in URLs with a different string. Setting this command will clear any previous value for the command; calling it with no parameter will cancel the replacement. Select any session where the response Content-Type header contains the specified string. Select any session where the named Header or SessionFlag contains the specified string. Hide all sessions except those where Content-Type header contains the specified string.